This happened a few weeks ago. I kept it quiet and reported it. Hasn’t happened again, and I haven’t heard anything, so I presume it’s fixed. 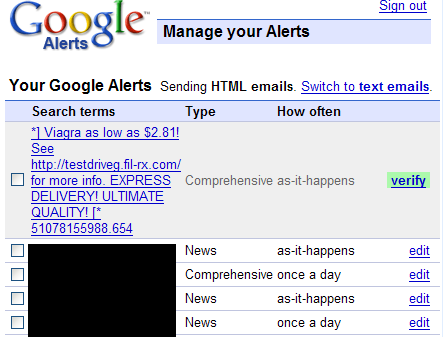 So apparently a spammer was smart enough to realize they could hijack this functionality to send spam through Google. I emailed Google a few week ago about this problem, and didn’t hear back. I haven’t seen another, so I presume they fixed this problem by now. From what I’ve read Google is pretty prompt with this stuff. This just shows how careful you need to be with security of web forms. Even something innocent sounding like this can be hijacked to send nasty payloads. A spammer could have used this to send links to infected files, etc. All looking like legitimate Google emails (because they are from Google). [ *] Viagra as low as $2.81! See http://SPAMSITE/ for more info. EXPRESS DELIVERY! ULTIMATE QUALITY! [* 51078155988.654 ] to r-----@---------.com. Postage for Email? My Internet != Your Internet? I got a lot of spam sent through google email servers. I sent two email to Google security teams, but they ignore my mail. I do have a barracuda spam filter, but unless I block google’s ip address or gmail domain these spam keeps going through. Do you know where and how to get google security team to take a look at the problem. This hasn’t been fixed so far by Google – I just got spammed by this. i want to stop google alerts on my email-id ….plz let me know how can i do that…..i will appreciate if u do the needful as soon as possible. I know this is a year later but I’m getting spam off one of my alerts mostly titled something like ‘ Amanda Dunn Adam Fletcher wedding’. It’s an alert based on my late wife’s name and this will be there in the first few lines. However, when you click on the link you get a big red circle which says ‘Do Not Press’ and a small underlined ‘Skip’ at the top of the page. Yesterday, as I was about to install Win 7 over XP I decided to take the risk of clicking, something I would never normally do. It just went on changing to ‘witty’ things like ‘Oh, so you’re being tough’ and ‘Told you not to press’ Tried Skip. That led nowhere. Closed down and wiped the drive as I installed the new OS. It’s irritating as I’m now getting 3 or 4 of these alerts a day. When I tried to find somewhere on the Google site to report this I got led round and round the bush, as always. How did you get through to them? It only seems to affect the one alert. Have you had anything similar, and is there anything, short of deleting the alert (which I don’t want to do)?